another blog perhaps? I'm not sure. door to my kids' bath with Command velcro adhesive. with a little aqua thrown in. The shower curtain is an old one from Target. We replaced the light fixture about a year ago. like I did in my master bath, but the mirror is off center from the vanity. It isn't really obvious, but if I framed the mirror, it would be very obvious. is centered over the mirror and not the vanity so it would still look funny. staying put and not framed for now. add a little somethin' something to it. 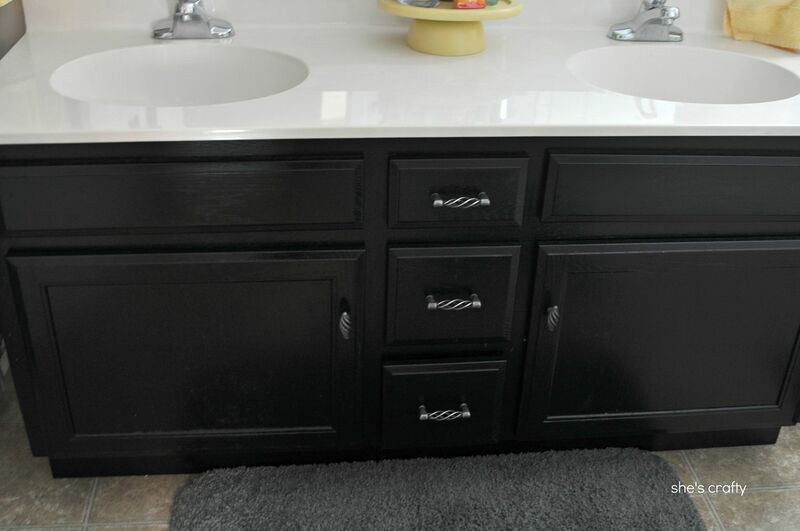 I painted the vanity cabinet black. 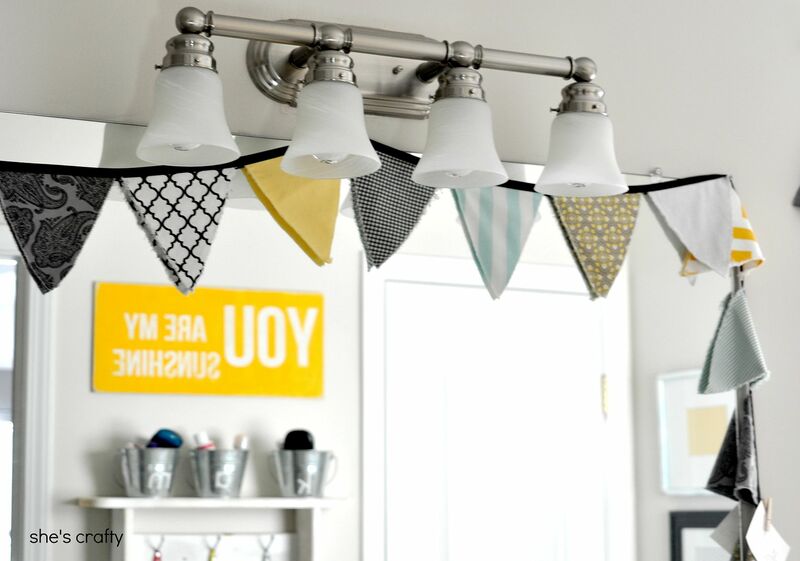 I sewed strips of ribbon onto them for easy hook hanging. The shelf holds buckets of my kids toiletries. 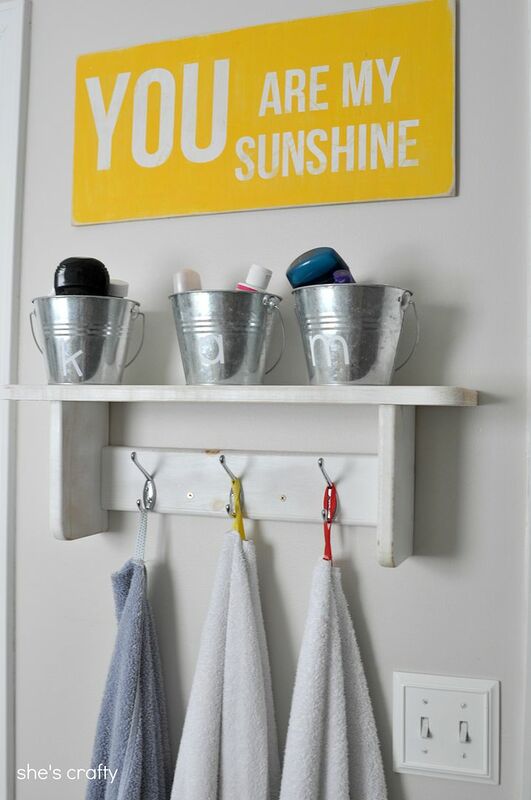 The You Are My Sunshine sign I made just for this space. This is the frame collage that I've already posted about. 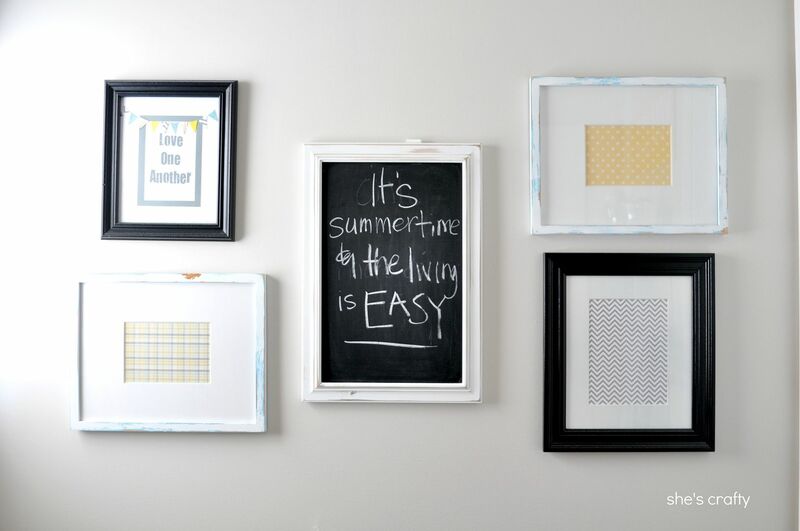 chalkboard paint for a little message board. It's a very bright and happy space for my kids. LOVE the icons on the door! What a cute idea! Adorable Bathroom! Love it! Love the fresh pops of color!!! Nice job! I am working on my kiddos bathroom... lagging big time though! ha! Love the vanity, the sign but most of the all the people on the door ... SO cute! Ok I need you to come visit for a few days and help me make over my whole house.. ok well maybe it would take a little longer but YOU have such an amazing eye for decor and I LOVE IT!! Wish we lived closer!! I love it!! I've been meaning to get my kids' bathroom done, but have been procrastinating! I saw those boy/girl signs before somewhere too, but I can't think of where. Great job!! I am totally stealing (i mean honoring you by doing it too) the idea of the people on the door. That is absolutely darling! I also love the pennants around the mirror. The whole room is super cute! Hey Candice! It's adorable! 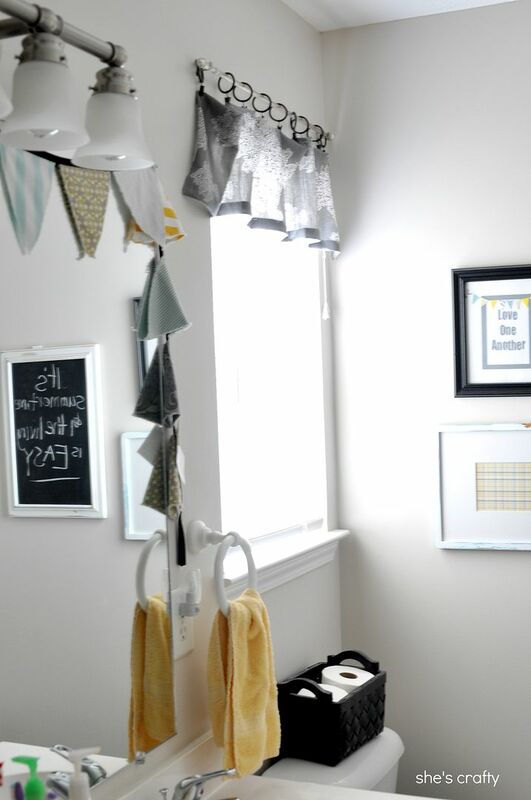 I'm still thinking grey and yellow for one of our bathrooms... or our bedroom! Who knows. I just need to find a little time! 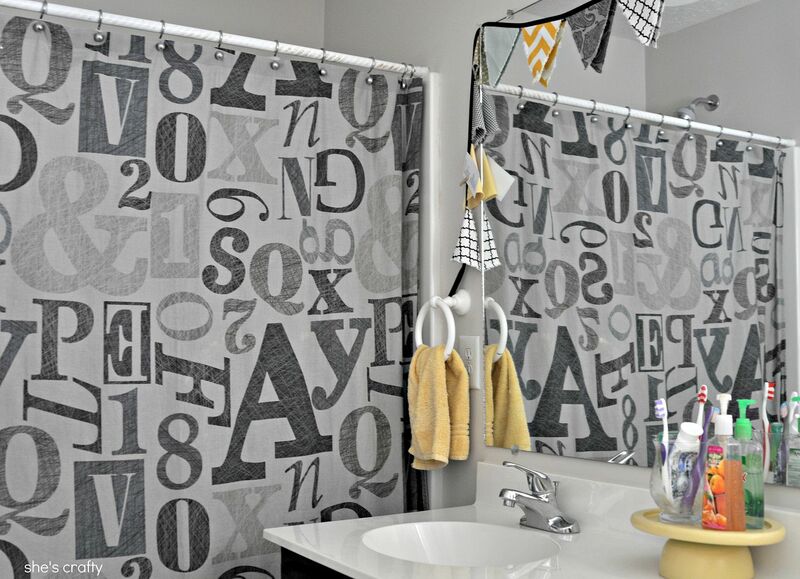 I love what you did with this bathroom! This bathroom is FANTASTIC! Love the color scheme you went with! I think you might have pushed me over the edge to paint my boys vanity black! I have been wanting to but was to intimidated! Was it hard? 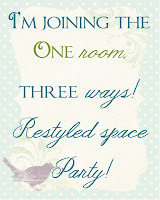 Would love for you to come share at my first party! i love the color combo in here, and definitely the door art! I love the icons on the door! I saw some vases that look like that but they are much thicker. I wanted to put them on my bathroom door but figured they'd be too big, so I'm hoping my Michaels has these! Too cute! I also LOVE LOVE LOVE the color scheme. It looks beautiful! 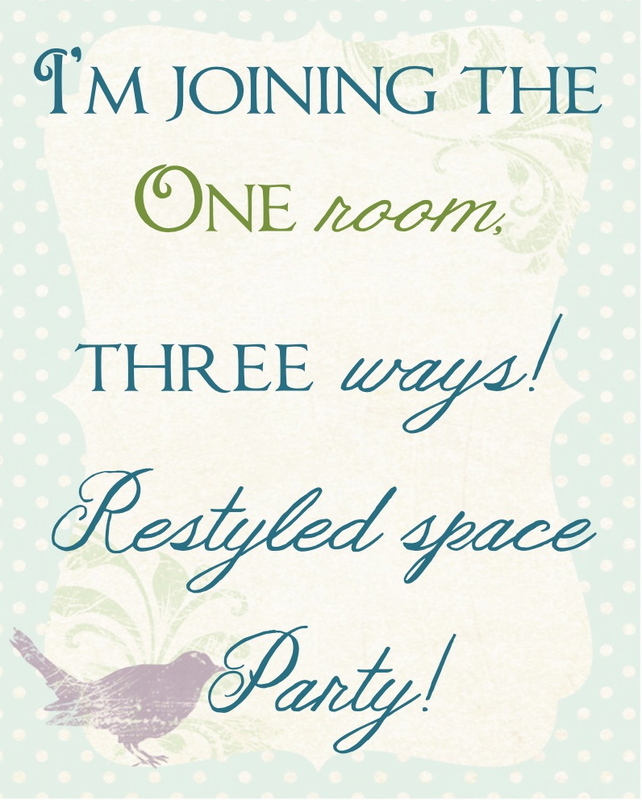 :) I'd love for you to link up at my Throwback Thursday link party! Super cute bathroom! I have vinyl boy/girl icons on my bathroom door ... I love them! Your makeover looks so great ... love the color scheme. so stinkin cute! great job! I love love love the icons on the door! What an adorable idea! 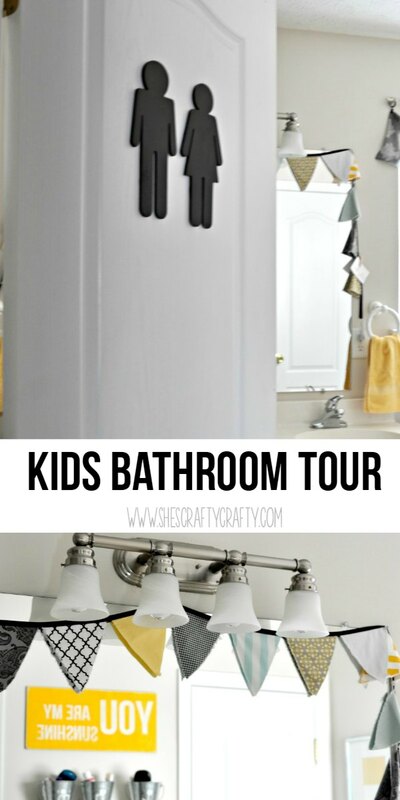 Cute bathroom, not only for the kids! Thanks so much for sharing this at my Throwback Thursday party! You already know how much I love it! :) I hope to see you again this week and can't wait to see what you share!! I love your bathroom! The little "people" on the door and the pendant on the mirror are definitely my faves!! Wonderful work!!! Love it all! The people on the door, the pennant hanging on the mirror, the sunshine artwork. But, the strip of ribbon on each towel...genius! My son's towel often falls off his hook and onto the floor, now I know how to help him. Oh, and you've made me want to paint the vanity in my bathroom black. Great job! Love the icons on the door!! I'll feature your post in my blog, with the proper link, of course! Bright, fun and inviting - and I love the little people on the door! 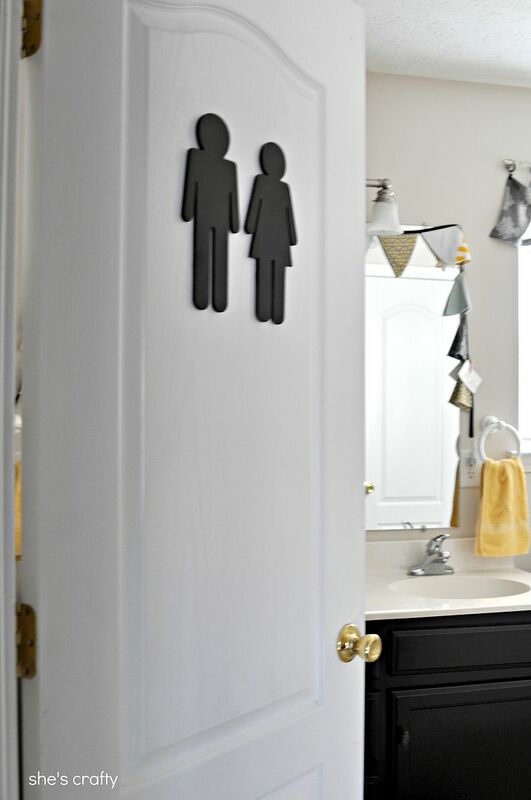 Do you have a full-face picture of the bathroom door (boy and girl icon)? Or can you give me a link to where you found these at Michael's? SO cute, and my daughter wants me to make her some for Christmas! I love the boy and girl for the bathroom door. I am going to Michael's tomorrow to see if I can find them. Our guest bathroom is at the end of our hall and I would love to put something on the door (that husband would agree with) so people know which door to go in. I hope they still have them since I think they are plain enough that it will fly with the husband.